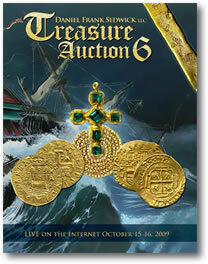 Specialists in world coins and treasure items Daniel Frank Sedwick, LLC has released their sixth and largest Treasure Auction, available immediately for viewing on their website, www.sedwickcoins.com. This auction features well over $1 million in coins, ingots, artifacts and books, almost all of it opening at very reasonable levels. Because of the size of the auction this time, Sedwick has split this sale into three sessions, all closing LIVE on www.iCollector.com/sedwick. "After our first live Internet auction last time, we decided to hold our Treasure Auction #6 in three sessions to provide breaks and avoid bidders having to monitor the auction all day long to bid live on the lots they want," says Sedwick. "Also there is no more confusion about the buyer’s fee, which is set at 18% for everyone (discounted to 15% for check or cash)." World gold coins feature a Mexican bust 8 escudos 1733 PCGS AU-58 ($15,000-up) and a Paraguayan cut 4 pesos fuertes (1866-9) ($12,500-up), one of only two known. In the shipwreck silver section you will find a Cartagena cob 8 reales 1621 ($16,000-$25,000), first date of issue and one of three known, plus the Louis Hudson collection of Potosí countermarks 1649-52, as well as selections from the Atocha (1622) Research Collection and a newly formed "Coconut wreck" (ca. 1810) Research Collection. The four silver-cob sections in Session II (Thursday, October 15, 4:30 pm EDT) feature a La Plata cob 1 real (estimated at $700-$1,000), the first ever offered at auction; a unique Potosí cob 2 reales specially struck on a zoomorphic planchet in the form of a double-headed condor ($25,000-up); the finest-known Panama cob 4 reales (estimated at $5,000-$7,500); and Part I of the extensive collection of late world-coins dealer Mark Bir. The world silver coins section, which is becoming larger and more advanced in Latin American coins with every auction, features several key rarities as well as Part I of the Colombian Republic collection of Herman Blanton. Session III (Friday, October 16, noon EDT) starts with a wealth of shipwreck gold and silver bars, featuring 6 "tumbaga" silver bars from the "Tumbaga wreck" (ca. 1528), 2 gold "finger" bars and 4 huge silver bars from the Atocha (1622) and one highly desirable small-size Justh & Hunter California Gold Rush ingot (estimated at $50,000-$75,000) from the SS Central America (1857). In the shipwreck artifacts section you will find a very high-quality emerald cross from the 1715 Fleet (estimated at $10,000-$15,000), in addition to many other treasures continuing in the non-wreck artifacts. Rounding out the sale are documents and books, plus the third and final offering of treasure auction catalogs from the Tom Sebring library. Says Sedwick: "As always, we research and present each item diligently and put our long-standing reputation behind every lot. We wish you luck in adding more of this fine treasure to your own collection. Please register to bid today at www.iCollector.com/sedwick." I was given a 1702 escudo. There was only one person who gave me any information and I was told that it’s a 2 escudos piece. He offered $1700, but I have received feedback from some who believe his offer was low. I know it’s hard to know unless you have it in your hand, but I was wondering if based on a picture, you would be able to give me a range for that type of coin, should it be what it seems and if you are able to help me sell it? I have 2 photos (front and back) of the coin that I can send. It is in a pendant setting.